Savory or sweet? Chocolate or jamón? A glass of red wine or café con leche? Breakfast...lunch...dinner...merienda? 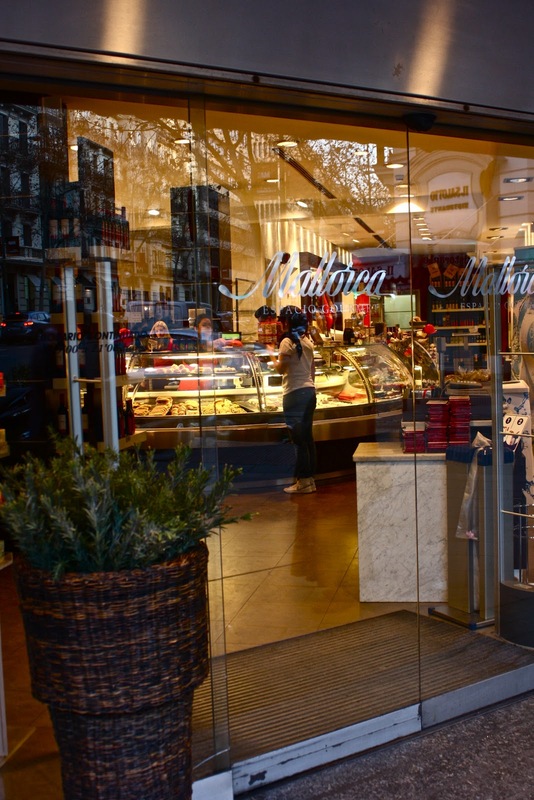 Meet a friend for coffee, grab a bite to eat, time for a picnic... Mallorca (not referring to the beautiful Balearic island) is a gourmet pastelería and delicatessen located throughout various parts of Madrid. It is a shop that specializes in selling foods with an overly satisfying quality and luxury presentation. Mallorca has it all: sandwiches, salads, fresh bread, mini-baguettes, croissants, chocolates, truffles, cookies, and anything else that you can possibly dream of to satisfy your cravings. Feel like something savory? Head to the savory section of Mallorca where you will be tempted into tasting fresh goat cheese, the Spanish sausage chorizo, or a slice of Spain's most prized food: jamón. Make a meal out of your visit to Mallorca and head over to the sweet section after where you will find the irresistible fruit tarts, mini cakes, cream puffs, and pastries. 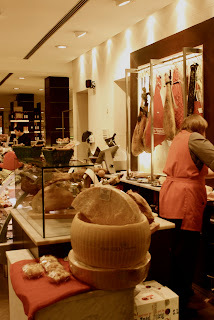 If you do not want to buy something to take away and nibble on the street, Mallorca also has its very own section with high tables for those who want to stay for a while, enjoying the exquisite service, company, and social atmosphere of this delicatessen. Like I said before, there are a few Mallorcas located throughout Madrid, but my favorite one where I tend to be at least 3 times a week is located on Calle de Veláquez 59. NOTE: Before making your visit to el Parque Retiro, Madrid's most famous and beautiful public gardens, you must stop at Mallorca to create your very own gourmet picnic!